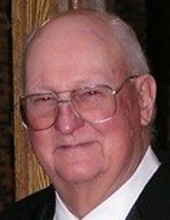 Richard F. Meyer, age 89 of Clarence, passed away on Sunday March 24, 2019 at the Clarence Nursing Home. Funeral services will be held on Saturday March 30 at 10:30 A.M at St. John’s United Church of Christ in Clarence with Reverend Matt Schneider-Adams officiating. Burial will follow at St. John’s Cemetery. Visitation will be held from 9:00 A.M until service time at the church. Richard was born on October 2, 1929 in rural Lowden to Dietrich and Meta (Schlueter) Meyer. He married Joan Muesing on May 16, 1954 in Tipton. Richard served his country in the Army during the Korean War as a combat engineer and received two bronze stars. He was a member of St. John’s UCC and was a member of the Clarence American Legion for over 60 years. Richard farmed his entire life in the Clarence area and loved raising livestock. He enjoyed attending his children’s and grandchildren’s sporting events. Richard was on bowling teams for many years, liked to play cards, and enjoyed “going to the track”. He was a kind & gentle man, and never had a bad thing to say about anybody. He is survived by his wife, Joan; children, Jeff (Kathy) of Hubbard, Patti (Jeff) Matthews of Orlando, FL, Dan “Boo” (Debra) of Clarence, and Debbie (Brent) Coppess of Buffalo Grove, IL; grandchildren, Ryan Meyer, Alaina Christian, Emily Baker, Gregory Matthews, Melissa Matthews, Derek Meyer, Dawn Meyer, and Spenser Coppess; 8 great grandchildren; sisters, Jeannette Brendes and Betty Ann Miller; brothers, Harlan (Shirley) Meyer and Dwain Meyer; and many nieces & nephews. In lieu of flowers please direct memorials to the Clarence American Legion. To plant a tree in memory of Richard F. Meyer, please visit our Tribute Store. "Email Address" would like to share the life celebration of Richard F. Meyer. Click on the "link" to go to share a favorite memory or leave a condolence message for the family.